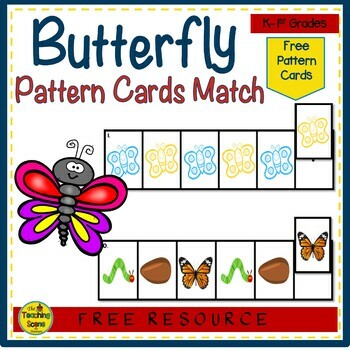 Free Butterfly Pattern Match Card Games to Practice Patterns! Resource Prep: Print, laminate and cut all cards and pieces to the activity. You can cut out the individual pattern card strips or leave them as a whole sheet. Directions are also located on the game card set. Note: You can choose to do all the cards or take out the patterns you are working on at the time. 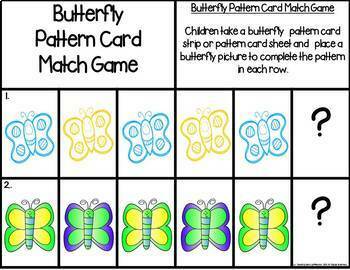 Butterfly Picture Pattern Match Game: Children take a butterfly pattern card strip or pattern card sheet and place a butterfly picture to complete the pattern in each row. 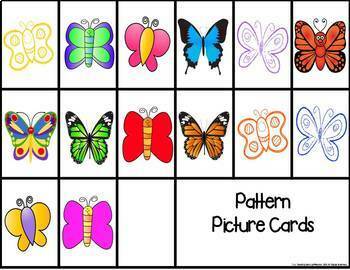 Butterfly Picture Pattern Pictures: Butterfly Picture Cards to match with the Pattern Strips. Kids have some butterfly themed fun while practicing their patterning skills. 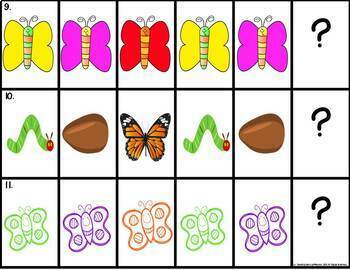 ❀ Butterfly Counting Games: How Many Butterflies?